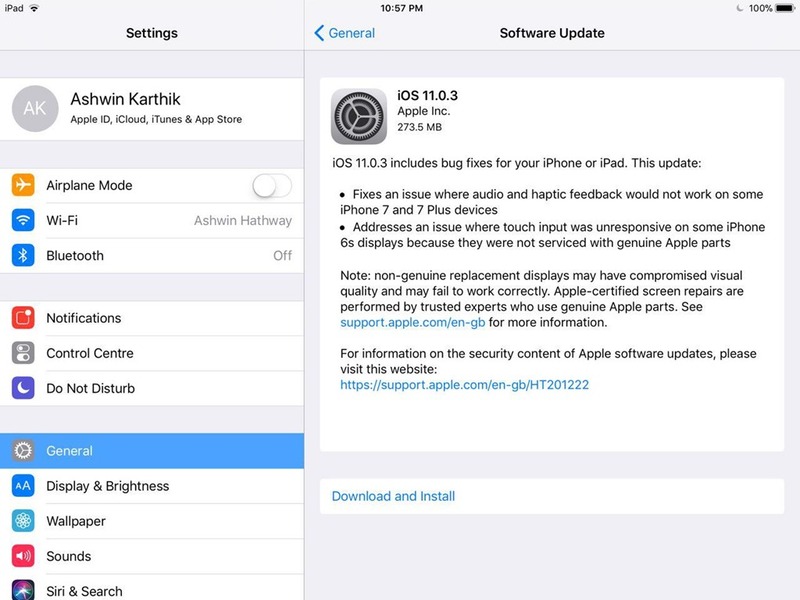 Apple has released iOS 11.0.3 today, about a week after releasing iOS 11.0.2. The update is mostly a bug fix one, and targets iPhone 6s, iPhone 7 and iPhone 7 Plus devices. According to the change log, the iOS 11.0.3 update fixes audio and haptic feedback on iPhone 7 and 7 Plus devices. Apple made an odd statement on the release notes, which says that some iPhone 6S users who had their device serviced with non-genuine Apple parts, experienced non-responsive touch input on their displays. But according to a reddit thread, people who never had their screen replaced also experienced this issue. So it appears that Apple could have messed up something on their side, and is trying to shift the blame by partially admitting to the truth. We installed the iOS 11.0.3 on our Apple iPad 9.7 2017, and it seems fine. It's a bit too early to comment on the battery life, so we will keep you updated if we observe any major impact. To be honest, I am easily getting over 12 hours of usage, with well over 72 hours of standby on the tablet ever since iOS 11 was released. iOS 11.1 is just around the corner, and will bring new emojis, and hopefully some other fixes for issues which has affected Reachability, the Lockscreen, etc.